Import hashes from a remote host. The program has means for dumping hashes from a remote host without employing third-party utilities. 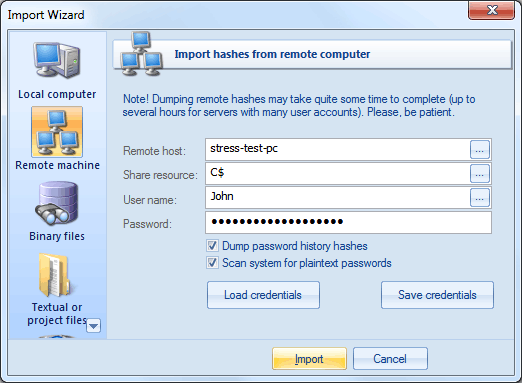 This does not compromise the remote system, as it still requires supplying the credentials for the remote host user. Dumping from a remote host works as follows. First, you should enter the remote hostname in the Remote Host field. You can use the [...] button to browse the network. Once you have selected the remote host, set up a shared resource (allowed for both reading and writing), through which the data will be transmitted. Usually, that is either C$ or ADMIN$. Here too, you can take advantage of the browse button to the right of the edit box. Next, in the two fields at the bottom type in the remote host account name and the password. The 'Save Credentials' button saves the current settings. Respectfully, the 'Load Credentials' button allows loading of existing settings, so that you don't have to enter them manually every time you need them. The password is stored in the encrypted form! The import feature requires administrative privileges. When a user with an administrator account in a Windows Vista computer's local Security Accounts Manager (SAM) database remotely connects to a Windows Vista computer, the user has no elevation potential on the remote computer and cannot perform administrative tasks. If the user wants to administer the workstation with a SAM account, the user must interactively log on to the computer to be administered. Then create DWORD value LocalAccountTokenFilterPolicy and set it to one (1). So you will be able to connect to the admin share.